The Swiss Carbon Alphorn is made of a carbon fiber compound laid up in a diagonal overlapping pattern. 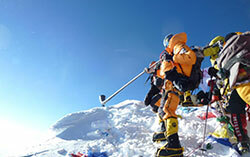 Exceptionally strong, this material is used in the finest racing bicycles, boats and aircraft parts. The acoustical properties are excellent, although the alphorn is extremely lightweight. With this alphorn one need not fear the combination of humidity and temperature. It will not crack because of adverse conditions. In fact, it may be disassembled entirely from time to time, and washed and dried to remove any dirt, dust or foreign material. 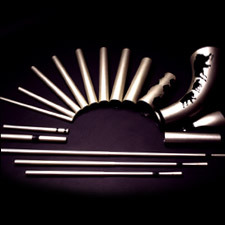 The basic Swiss Carbon Alphorn is telescopic in ten sections – Because of the precise machining and manufacturing techniques, it is absolutely airtight. 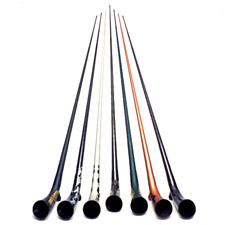 The complete Swiss Carbon Alphorn is in six tonalities – G, F#, F, E, Eb and D. Unlike the typical wooden alphorn, the Swiss Carbon Alphorn is INFINITELY tunable. A separate section which incorporates a tuning device can be substituted for Section n°2, making the G, F# and F tonalities tunable. With or without this special section, each of the three lower tonalities, E, Eb and D, consist of a three-piece section which is tunable within itself. The pitch is excellent throughout the entire range and the response is quick and clean from the lowest to the highest harmonics. Besides an alphorn in six tonalities, this instrument can be transformed into a horn without a bell, more correctly called a Büchel in G, Ab, Bb or C. You can also play it like a “slide didjeridoo”. If one has interest in the Australian didjeridoo, five of these can be formed as well – one can assemble a Bass, Baritone, Tenor, Alto or Soprano. 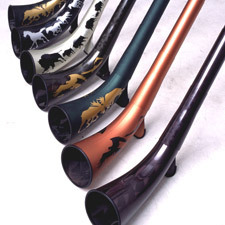 The playing of the didjeridoo can be made more comfortable with a special section with a wax-like rim. Posed upon a water surface from a boat in the center of a lake surrounded by trees (or mountains), the sound will enchant you by the creation of wonderful echo-effects. Warning : Carbon is an excellent conductor of electricity; therefore this new type of alphorn should never be used near sources of electricity and/or high-voltage cables, and/or during thunderstorms, especially, if like Zaneth, you take advantage of its light weight to lift this long horn and play in the direction of the gods.